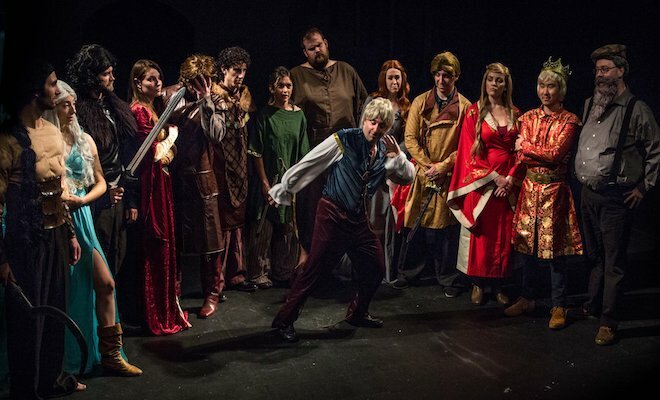 After rave critical reviews and sold out performances, Off Broadway’s Game of Thrones: The Rock Musical – An Unauthorized Parody has announced that it will be extending it’s limited engagement NYC run through December 30th at The Theater Center (210 West 50th Street). The new rock musical is a hilarious musical parody of HBO’s smash hit fantasy series of dragons, dwarfs, and danger! An evil prince, backstabbing siblings, a stalwart hero, a hysterical imp, the mother of all dragons and an addictive rock score that will stick in your head – unless the king orders it off! Watch your favorite daring and most despised characters sing and dance towards epic plot twists and the coveted iron throne! It would be a Shame, Shame, Shame to miss it! We can’t hold the door forever, so get your tickets now! Go back to the beginning and re-visit all your favorite characters and the ones you love to hate. Re-live Jaime pushing Bran out the window, Khal Drogo learning how to love, and do you remember when everyone hated Jon Snow and Sansa actually wanted to marry Joffrey? Spoiler alert – this show has heads rolling… with laughter! The cast of Shame of Thrones: The Rock Musical – An Unauthorized Parody features Ariel Barber, Peter Berube, Drew Boudreau, Jeff Bratz, Konrad Jeffrey Custer, Billy Finn, Mandie Hittleman, Zachary Evan Kanner, Randy Wade Kelley, Delilah Kujala, Allison Lobel, Ace Marrero, Meghan Modrovsky, Ryan Pifher, Milo Shearer, Kacey Spivey, Erin Stegeman, and Jay Stephenson.